Fascinating historical fiction (and historical fiction at it’s best) regarding the taking of Florida by the Spanish in 1555 and subsequent exploration of Texas and New Mexico. The 1st person narrator is a Muslim slave from Morocco. Kind of amazing that a woman should write so commandingly about a Black, male, Moorish slave and perhaps conquistador in the days of Cortez. A lot of it is based on an historical account of the Narváez expedition in 1527-1536 in which a Moroccan slave named Estevanico (many names) is mentioned and he was one of the 4 survivors to reach Mexico City. 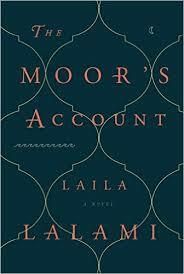 The fiction in Lalami’s book is equal to the history – they truly intertwine. The Moor’s Account is shaped like a sixteenth-century Arabic travelogue. The preamble, which begins with a Basmala, contains some of the usual disclaimers to be found in such books. The narrator notes the passage of time according to the Hegira calendar, uses Arabic units of measurement, and refers to places with their Arabic names. The dialogue in the novel lacks quotation marks in order to replicate the style of the manuscripts of that era. And the vocabulary used in the prose was researched to select lexicon that dates back to the sixteenth century and is still in use today. Rather than chapters, The Moor’s Account alternates between two sets of stories: some chronicling the Narváez expedition, and others narrating Mustafa’s life prior to his arrival in the New World. It’s a powerful book – the story line works wonderfully with the historical elements. If you enjoy good historical fiction this is highly recommended!